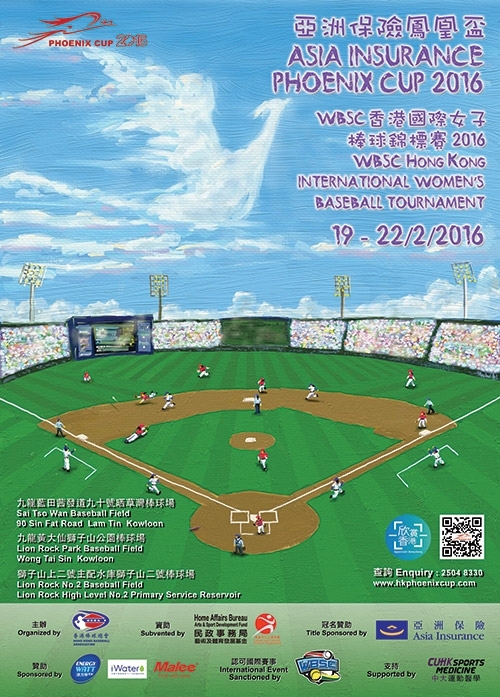 The Hong Kong Baseball Association (HKBA) is proud to announce that the international event sanctioned by World Baseball Softball Confederation (WBSC), “Asia Insurance Phoenix Cup 2016” WBSC Hong Kong International Women’s Baseball Tournament, will be held on 19-22 February 2016. It is the ninth year for HKBA to host the tournament, we appreciate Asia Insurance for the continuous support to take up the role of Title Sponsor and the subvention from the Arts and Sport Development Fund (ASDF) of the Home Affairs Bureau and the Leisure and Cultural Services Department of Hong Kong SAR. The event is one the listed events in the "Appreciate Hong Kong" Campaign, let's appreciate, show gratitude for, understand or add value to Hong Kong. There are twelve teams including Australia, China, Guam, Japan, Korea, Singapore, Taiwan and Hong Kong to compete for the crown of a newly designed “Defenders Cup” that was generously donated by the World Baseball Softball Confederation (WBSC). We anticipate a remarkable and enjoyable event for all participants coming from different regions of the world. Welcome all the players, coaches, managers, supporters and media, and wish all a happy stay in Hong Kong.